Throughout the history of this blog, we’ve mapped any number of geographically-specific social phenomenon. But often times, we’ve been drawn to mapping things associated with the American South, whether because it’s arguably the most distinctive cultural region in the United States or because all of us have lived on its outskirts for some time or another, we’re not quite sure. But if you had to choose just one region to map using social media data, the South is probably a good place to start. Continuing this persistent obsession, we decided to map one of the South’s most prominent culinary traditions: grits. As such, we collected all geotagged tweets in the United States from June 2012 to September 2014 mentioning the strange (read: awesome) ground-corn porridge-like dish, totaling around 64,000 tweets. Keeping in mind that geotagged tweets still represent only around 2-3% of all tweets, this figure represents a breakfast table conversation of several thousand tweets per day, and highlights the ability of this kind of social media data to provide insight into a particular cultural phenomenon that is relatively more difficult (though certainly still possible) to measure through more conventional means. The map below represents a normalized visualization of grits-related tweeting throughout the continental United States. Using a grid of hexagonal cells, the number of grits tweets were normalized using an odds ratio by a random sample of tweets from the same time period. In this measure, a value of 1 signifies that there are exactly as many grits tweets in a given location as one would expect according to the baseline measures of tweeting, with values greater than 1 indicating that there is a greater predominance of grits tweets than one would otherwise expect. In effect, this analysis cuts out the potential for these maps to simply reproduce maps of population density, honing in on the actual phenomena at hand. Indeed, here you can see that while the South in general demonstrates a general preference for grits over the rest of the country, it is actually a relatively small number of coastal localities in the low country that have the strongest connection to grits through social media. While New Orleans represents something of an outlier in the far corner of the South, there is also a consistent band of concentrated grits tweeting stretching from just north of Charleston, South Carolina down through Beaufort (though seemingly skipping over Hilton Head, a popular tourist destination that might be understood as relationally disconnected from much of the rest of the distinctly southern culture surrounding it) and Savannah, Georgia, all the way to Brunswick. In general, this map demonstrates the general potential of this kind of method to locate geographically-specific cultural practices in space, as well as the notion that these kinds of maps can reinforce the persistent connectedness between virtual representations of the world and people’s everyday lives and material practices. But there is more that we can do with this data by putting it into relation with other datasets. The map below does just that, by comparing our existing dataset of tweets mentioning ‘grits’ with all geotagged tweets during the same time period that mention ‘oats’. We again employ the odds ratio measure, but rather than comparing using a baseline population of tweets, we use the oats-related tweets to normalize our values. In this analysis, values less than 1 signify a preference for oats, while values greater than 1 represent a tendency towards grits. Not only does this comparison continue to affirm the identification of a ‘grits belt’ in the South, but it also highlights other areas of the country – an ‘oats oval’ stretching from the Northeast to the Midwest – that stand in stark contrast to the southeast in terms of digital porridge discourse. Thus a key avenue for analysis of digital social datasets is examining the relationships between individual users or individual messages. It is also possible to identify relationships between places, based on visits or tweets made by the same person in these different places. 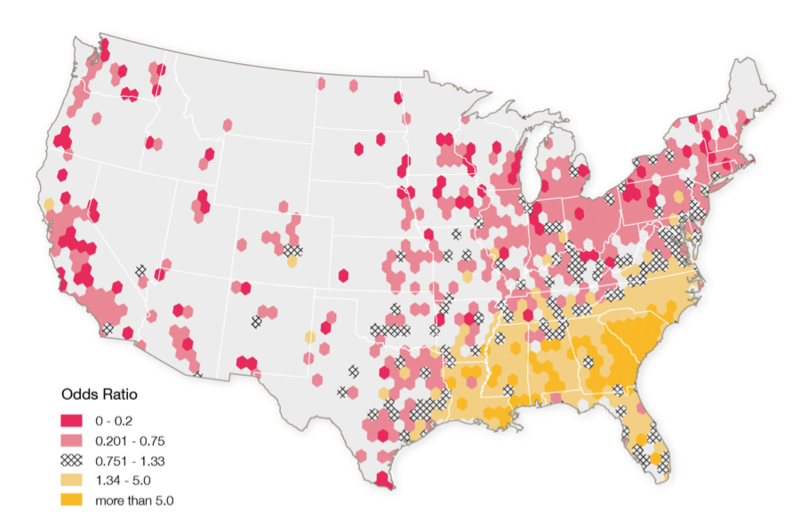 While we’ve already identified the South as the key locus of grits-related tweeting in the United States, it’s important to not simply ignore all of the other data points available to us that are just not quite as spatially clustered. Indeed, given the strong connections between the cultural practice of grits preparation and consumption and the vernacular region of the South, we might hypothesize that even those people tweeting about grits outside of the South are likely to have some kind of connection to the South, perhaps as a kind of diasporic community now living in other parts of the country, or even just traveling for a short period of time. To examine this relationship, we begin by looking for users in our original dataset that have tweeted about grits more than once – yielding a total of 8,958 users – then drawing a line from the tweet locations in chronological order. 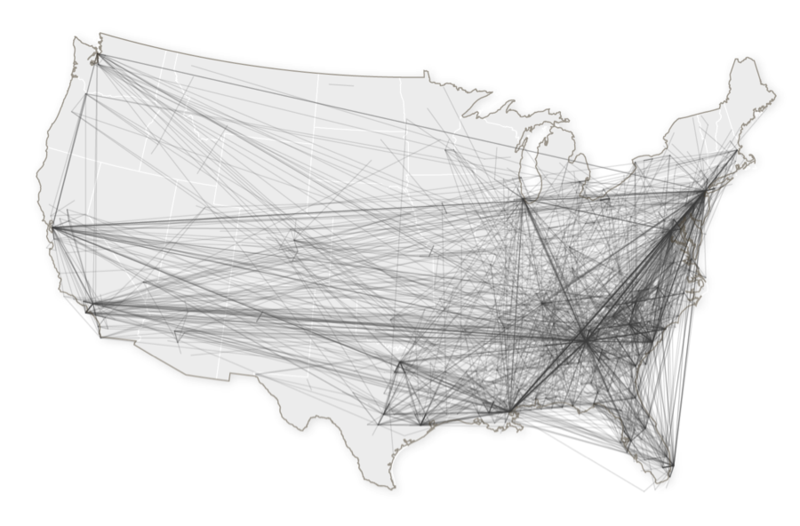 The resulting map below clearly shows that there is a strong relational connection with the South for those who tweet about grits from other places, even for cities like Los Angeles that are quite distant in absolute space, as well as in terms of cultural identity. Indeed, the gravity of grits appears quite strong, as of the users tweeting about grits from outside the South, approximately 55% of these also sent tweets from inside the cluster identified in the first map in this post. So even for those grits-obsessed tweeters outside of the South, the pull of porridge remains strong… and, we would expect, even stronger when you throw a bit of cheese and jalapenos in, too. Poorthuis, A., M. Zook, T. Shelton, M. Graham and M. Stephens. Forthcoming. "Using Geotagged Digital Social Data in Geographic Research". In Key Methods in Geography, eds. N. Clifford, S. French, M. Cope and T. Gillespie. London: Sage. Abstract: This chapter outlines how one might utilize the massive amounts of web-based, geographically-referenced digital social data for geographical research. Because much of these data are user-generated and produced through social media platforms, we also focus on the pitfalls associated with such sources and the benefits of a mixed methods approach to these data. Not only can digital social data be mapped for visual analysis, it is also useful to use a range of quantitative methods to understand relationships between different subsets of the data. In addition, closer, systematic readings via qualitative methods of social data provides insights of particular people’s perceptions and experiences of the world around them. Thus, while making maps is often the starting point for geographers working with this kind of research, it is rarely the end point.